< Valentine Magnet Badge Card Gift Tutorial! Apologies for the lack of blogs recently, I’ve not been very well. As such today’s tutorial is a little shorter than I would like. In essence though the technique is the same as in the previous tutorial for the Heart Badges/Magnets on card. 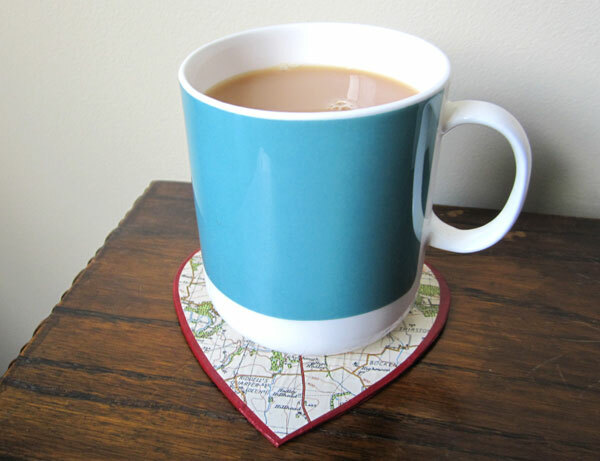 I think these make the perfect coasters all year round, hearts are most definitely not confined to Valentine’s Day in our house. 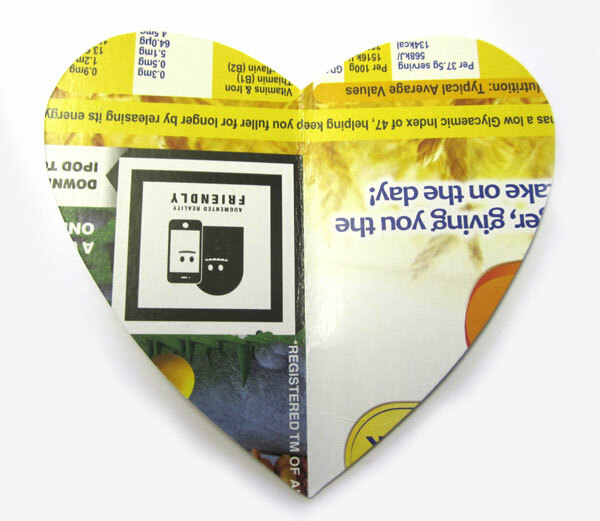 Start by cutting out a large coaster sized heart from the thin cardboard (old cereal boxes work perfectly). 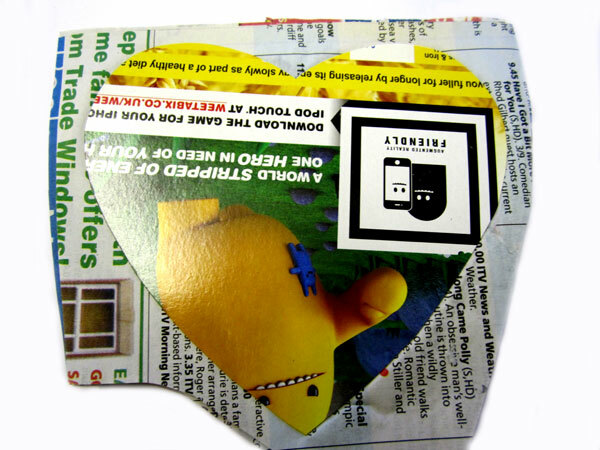 As in the previous tutorial, if you want to make sure the hearts are even, fold the cardboard in half then draw half a heart against the fold before unfolding and cutting out. Four to six hearts makes a good sized set if giving as a gift. 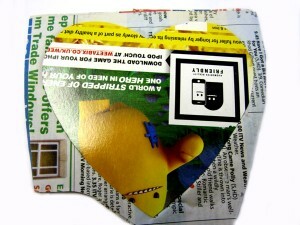 Using PVA glue, stick nine layers of newspaper to one side of the heart shape. Once dry, repeat the process on the opposite side. Remember to cut away any excess paper to keep your heart shape neat. If the heart curls slightly when drying, place it under a weight to flatten out. If it has badly curled use a hot dry iron (place brown paper between the shape and the iron), be careful not to burn it. Once dry, paint both sides of the hearts with acrylic paint (I used a burgundy colour). 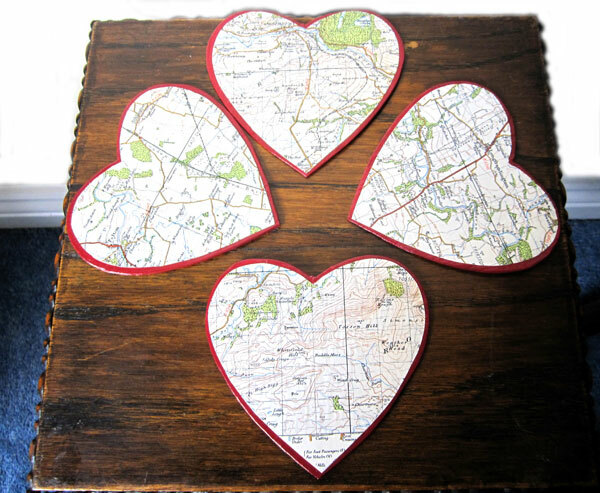 Next cut out a heart just slightly smaller than your original shape from decorative paper (I used old maps). Stick to the front; as it’s slightly smaller you should see some of the painted edge all the way around. Finally varnish both sides of your coaster with 3 layers of varnish. This entry was posted in Tutorials and tagged coaster, craft, gift, handmade, heart, heart ocast, idea, papier mache, tutorial, valentine, valentines. Bookmark the permalink. I think these are a good idea and don’t have to be just for a Valentine gift. I love these and the previous post, thanks for the ideas.